hi, i'm starting in on my first real attempts at game programming. i figured i'd start by copying my favrite game -> subspace. anyway, one of the things i was wanting to look at first was making it into a 2D coordinate system with polygons for both ships and walls. i know this is ambitious, but i figure i'll be able to handle it. so really what i'm wondering here is: is this something that's already being worked on? would it be helpful to priitk or whoever is keeping the game development going if i kept them informed/gave a copy of my code to be included in a future version of SS? (assuming i figure out the legalities before i screw myself over) Or is this something that's already in development and nobody cares about me? If this is honestly your first attempt at game programming I wouldn't start with subspace. Plus, the only person with access to the code for the game (Not the zone menu) is PriitK, and at the rate things are currently going it will be a cold day in hell before anyone else gets to look at it. Not trying to be mean or discourage you or anything (because it's good to be interested), but you probably should understand the reality of the situation. What I will recommend is that you look around and work in other areas of the community such as bots, or standalone helper applications like Drake has done with his new startup map editor. If this is honestly your first attempt at game programming I wouldn't start with subspace. Agreed. I'm not trying to be insulting or disrespectful, but you would be surprised how difficult things will become as you get deeper into the problem. If you are intent on games programming, I would try something like Breakout. This will give you some experience with graphics, sounds, and some simple physics, without the networking or multi-player issues. thanks both for good, thoughtful replies. i think what i'll do is make my own not-multiplayer version of this game. (breakout is boring as crap) that should help me focus on the parts that are interesting to me: physics modelling and graphics. 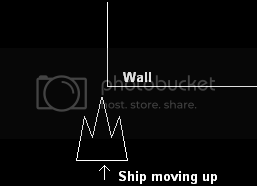 In the above picture it would appear the ship would first move to the left slightly, then then reverse entirely (or rotate, depending on how you look at it) when it's right wing clips the wall. i was hoping to put some rotation in there and put my first year physics courses to good use. a bigger question i want to figure out, though, is: could i make this different based on different settings? that way, some zones could be totally arcade-y and some could be super-realistic. Don't forget to realize that if minor positional and rotational changes can create larger changes in bouncing angle, worry about lag.